Pictures from FC Barcelona Players celebrating UEFA Champions League Victory. 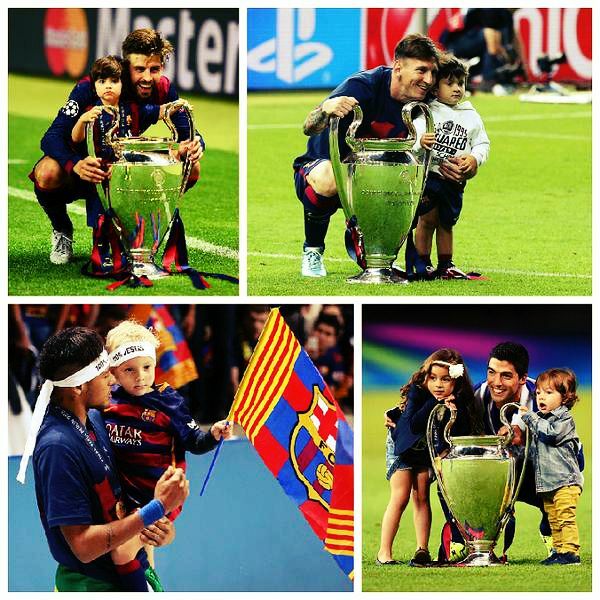 FC Barcelona players's kids celebrating the UEFA Champions League victory with their parents. 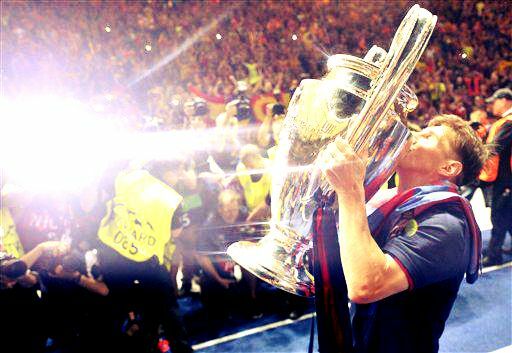 FC Barcelona secures fourth title in Last ten Years. Barca won their fifth European Cup beating Juventus in Berlin. Last December no one would have dreamed about this; we were in complete tatters, the team was disintegrating, trailing heavily in League and Europe wasn't much different. But from the start of 2015 the entire story changed and now we have completed an unprecedented second treble. No European team has ever done that. Now with this team, creating history is not such a big story, it's quite a usual stuff. This was not the vintage Barca performance, they struggled at the hands of Italian Champions at times. But then Luis Enrique has instilled a Warrior mentality in this team, a mentality which allows them to bounce back from whatever pressure that's been exerted upon them. The match started perfectly for Barca going 1-0 up very early in the match. Juventus equalised early on in the second half but as it has been this whole season - when it mattered Messi raised his game which allowed us to restore the lead. From there on there was no doubt about the outcome of the result, and Neymar's goal at the end of the match was just the icing on the cake. Don't think that this has happened ever before - Two Teams which will line-up in the UEFA Champions League Final are both in line to win a historic treble. But in the end only one team could emerge with the treble season done, surely hope that team is wearing the famous Blaugrana jersey. Even though Barca has been seeded as the away team, UEFA has given them the permission to line-up in their home jersey. We have a poor record as an away team at the UEFA Champions League finals - losing all three. Luckily neither do Juventus, they have been one of the under-performers when it comes to European cup finals. Interestingly enough, for both the teams this would be their eighth European Cup final appearance. Barca has a better record with four wins and three loses compared to Juventus five loses and two wins. Barca has a better advantage that in the later parts of the UEFA Champions League history, they have been the most successful team. Many pundits have described this function as a clash of the Juventus defense versus the Barcelona offence, which basically is a testimony for Barca's attacking powers as Juventus front line have been in top form in Champions League.